Eurocom is launching a free display calibration program for the recently launched 17.3” P7 Pro, Intel Z97 Express Chipset based High Performance Laptop powered by Intel® Core™ i7-4700 Desktop Processor Series and NVIDIA GeForce GTX 980M graphics, 32 GB memory, 5TB of storage through two M.2 drives and two standard 9.5 mm drives bays. “By offering customer free calibration on the P7 Pro, something that we have offered for some time at a modest fee, ensures our customers receive their P7 Pro with perfectly accurate and true to life colours and can fit into their work flow right out of the box.” Mark Bialic, Eurocom President. Another measure that ensure customers receive a system that fits right into their toolbox is by sending each and every system through a rigorous stress testing and stability program before sending any laptop to a customer. This quality assurance verification check is a series of benchmark testing software suites, software stability tests, physical check and verification. For a system to be sent to a customer it needs to pass all processes and signed off by a lead technician. Eurocom uses only the best available technology and high quality components like Intel Xeon Processors, NVIDIA Quadro Graphics, Sharp Display Panels and then stress tests the components before shipping to customers to ensure nearly 100% customer satisfaction and performance. “Our customers come to us to provide a high quality, high performance Mobile Workstations built to their exact specifications that operate perfectly right out of the box, every time, without fail. Our customer’s profession and livelihood is based on their Workstations capability to get things done and we work tirelessly to ensure they work perfectly. We ship our Mobile Workstations to customers all over the world, in the field so we work very hard to ensure that when we ship a system to a customer it is ready to go” Mark Bialic, Eurocom President. EUROCOM P7 Pro storage comes by way of four drive bays, two M.2. SSD slots and 2 standard drive bays for up to 5 TB of RAIDable storage. PCIe Solid State drives are supported for enhanced storage performance. The EUROCOM P7 Pro has Intel® Core™ i7-4700 Desktop Processor Series support from an Intel Z97 Express Chipset and LGA 1150 socket. The unlocked Intel Core i7-4790K and K series processors allow for enhanced performance and user control over their high performance system. The EUROCOM P7 Pro supports NVIDIA GeForce GTX 980M (8GB DDR5), GTX 970M (6GB DDR5) and GTX 965M graphics for unbeatable performance and raw power and NVIDIA Quadro K5100M, K3100M and K1100M for professional grade reliability and compatibility. 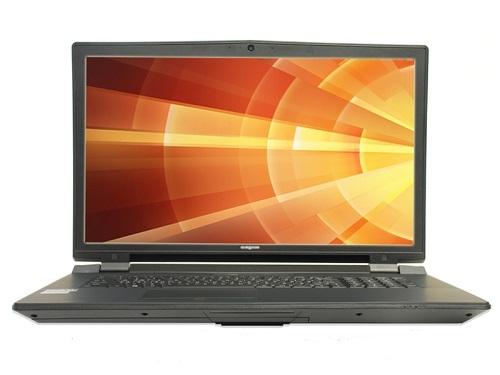 Eurocom integrates NVIDIA Quadro professional graphics into their professional class notebooks because they adhere to higher quality and reliability standards. NVIDIA Quadro GPUs are designed and built to provide leading performance, reliability, compatibility and stability with applications like Adobe Creative Suite 5.5, Autodesk 3DS Max, Autodesk Autocad 2011, Autodesk Inventor 2012, Avid Media Composer, Dassault Catia, Dassault Solidworks, Siemens X, ANSYS, MATLAB, Dassault Simulia, among many others. A Trusted Platform 2.0 Module is also integrated for enhanced security in order to keep your data and information as safe as possible.